Help Honor Flight Austin say Thank You to the Men and Women of the Greatest Generation, with A Trip of a Lifetime. We’re asking for your help finding every willing and able World War II Veteran in Texas so we can fly them to Washington D.C., free of charge, to see their WWII Memorial, built to honor their service and sacrifice. We want to let our most senior Veterans know that we did not forget and will not forget their service and sacrifice. You can fill out a Veteran Application here! 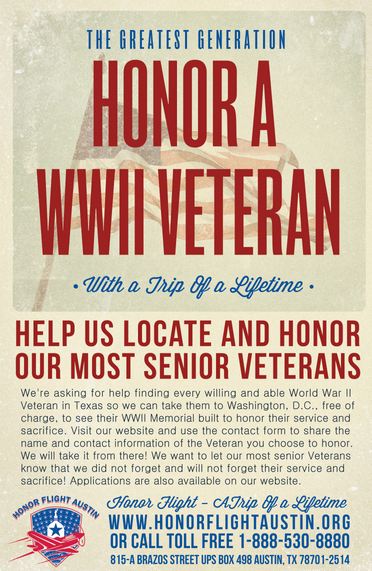 You can also refer a World War II Veteran for A Trip of Lifetime. Simply provide your WWII Heroes name, contact information in the contact form to the right and we’ll take it from there! Without your support, this trip of a lifetime would not happen. You play a major part in honoring our Veterans. Of all of the wars in recent memory, it was World War II that truly threatened our very existence as a nation and as a culturally diverse, free nation. It is estimated that 640 World War II veterans are dying each day, our time to express our thanks to these brave men and women is running out. 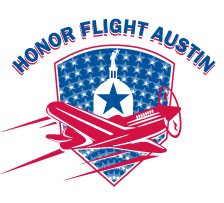 Honor Flight Austin is a 501 (c) (3) non-profit organization. If you choose to donate with a check, please make the check out to Honor Flight Austin or donate via our online secure form.